Conference of Presidents of Major American Jewish Organizations says U.S. withdrawal from UNHRC was an important step. The Conference of Presidents of Major American Jewish Organizations welcomed on Wednesday the United States’ decision to withdraw from the United Nations Human Rights Council (UNHRC). 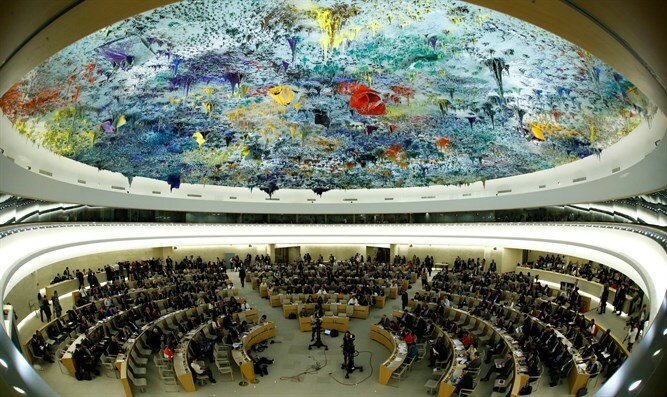 “The Trump administration’s decision to withdraw from the United Nations Human Rights Council (UNHRC) was an important step that reflects the longstanding frustration and disappointment of the United States,” said Malcolm Hoenlein, CEO/Executive Vice President of the Conference of Presidents. “The UNHRC has long been committed to an agenda that focuses on consistent attacks on Israel despite repeated protestations and warnings from the United States, Israel, and other countries. This has undermined the Council’s credibility and effectiveness, and its ability to promote and protect human rights globally,” he continued. “We hope the United States’ decision will provide an impetus for the United Nations to consider meaningful reforms that would allow the Council to return to its original mission and abide by the principles on which it was founded,” concluded Hoenlein. Ambassador Nikki Haley, in a joint press conference with Secretary of State Mike Pompeo, formally announced on Tuesday that the United States is withdrawing from the UNHRC, which she described as “a protector of human rights abusers, and a cesspool of political bias”. “If the Human Rights Council is going to attack countries that uphold human rights and attack those that abuse human rights, then the U.S. should not provide it with credibility,” Haley continued, while pointing out the Council’s blatant anti-Israel bias. “We are withdrawing from the UNHRC, an organization that is not worthy of its name,” said Haley. Israel welcomed the U.S. decision, with Prime Minister Binyamin Netanyahu calling the UNHRC a "biased, hostile, anti-Israel organization." “Given the state of human rights in today’s world, the U.S. should be stepping up, not stepping back,” he added.